UTAH LAKE STATE PARK — Over 100 volunteers came together at Utah Lake last Friday to help park staff clean up the popular area. The volunteers originated from the Park Stake in West Jordan Church of Jesus Christ of Latter-day Saints; specifically wards 1-8. 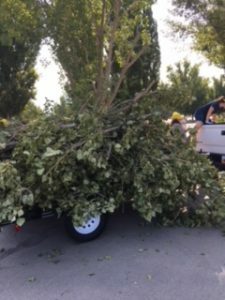 The group worked together picking up large amounts of branches that had been recently cut down by the Utah State Parks region crew. 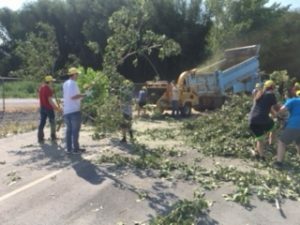 Volunteers then put the branches – some of which were quite large – into a wood chipper. 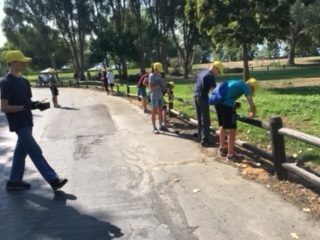 Many of the volunteers also lineseeded the wooden fence throughout the park. After a day full of hard work, Utah Lake State Park looked amazing. The Utah Division of Parks and Recreation would like to thank all those who came out to help at the project. The help is greatly appreciated and we are happy to see such an interest in helping keep Utah’s state parks beautiful. Interested in becoming a Utah State Parks volunteer? Visit our volunteer page to learn more! Learn More About the Volunteering With Us!